The 60th annual Puerto Rican Day Parade hit Fifth Avenue in Manhattan on Sunday, bringing the celebration of the Caribbean island to the streets of New York City. Politicians including Mayor Bill de Blasio, Manhattan Borough President Gale Brewer and Congresswoman Nydia Velazquez participated in the parade, that honored big names like olympian Laurie Hernandez and actress Jeimy Osorio. A participant marches on Fifth Avenue during the 60th annual Puerto Rican Day Parade on Sunday, June 11, 2017. Participants walk along Fifth Avenue during the Puerto Rican Day Parade on Sunday, June 11, 2017. Participants march in the Puerto Rican Day Parade in Manhattan on Sunday, June 11, 2017. A participant walks on Fifth Avenue during the Puerto Rican Day Parade on Sunday, June 11, 2017. Spectators wave flags during the Puerto Rican Day Parade on Sunday, June 11, 2017. Spectators cheer alongside Fifth Avenue during the Puerto Rican Day Parade in Manhattan on Sunday, June 11, 2017. Mayor Bill de Blasio participates in the Puerto Rican Day Parade marching up Fifth Avenue on Sunday, June 11, 2017. Participants hold up flags during the Puerto Rican Day Parade in Manhattan on Sunday, June 11, 2017. A young spectator holds up a flag during the Puerto Rican Day Parade on Sunday, June 11, 2017. Participants march on Fifth Avenue during the Puerto Rican Day Parade on Sunday, June 11, 2017. A woman marches and dances down Fifth Avenue during the Puerto Rican Day Parade on Sunday, June 11, 2017. Participants wave an oversized Puerto Rican flag during the 60th annual Puerto Rican Day Parade on Sunday, June 11, 2017. 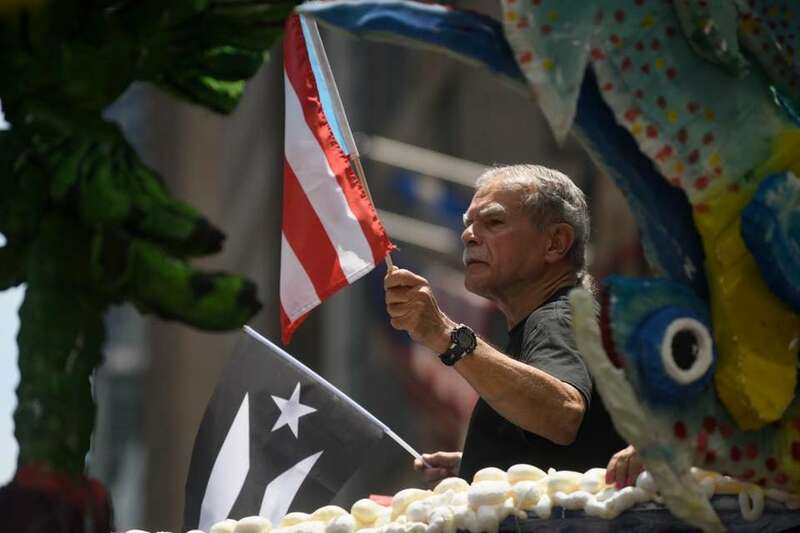 Supporters of Oscar López Rivera, the leader of the FALN separatist group that pushed for Puerto Rico's independence and was behind a series of bombings in New York and other U.S. cities in the 1970s and 1980s, march in the 60th annual Puerto Rican Day Parade on Sunday, June 11, 2017. Mayor Bill de Blasio marches in the 60th annual Puerto Rican Day Parade in Manhattan on Sunday, June 11, 2017. Oscar López Rivera rides on a float during the Puerto Rican Day Parade on Sunday, June 11, 2017. Manhattan Borough President Gale Brewer marches in the 60th annual Puerto Rican Day Parade in Manhattan on Sunday, June 11, 2017. A spectator holds a sign chastising Gov. Andrew Cuomo and the food company Goya for not attending the 60th annual Puerto Rican Day Parade on Sunday, June 11, 2017. Supporters of Oscar López Rivera march down Fifth Avenue during the Puerto Rican Day Parade on Sunday, June 11, 2017. Activists march in the 60th annual Puerto Rican Day Parade in Manhattan on Sunday, June 11, 2017. Supporters of Oscar López Rivera march in the 60th annual Puerto Rican Day Parade in Manhattan on Sunday, June 11, 2017. Spectators get ready to wave their flags as the 60th annual Puerto Rican Day Parade kicks off on Fifth Avenue in Manhattan on Sunday, June 11, 2017. Spectators gather along Fifth Avenue during the Puerto Rican Day Parade on Sunday, June 11, 2017. A participant dances during the 60th annual Puerto Rican Day Parade in Manhattan on Sunday, June 11, 2017. Rep. Nydia Velazquez (D-Brooklyn) marches in the 60th annual Puerto Rican Day Parade in Manhattan on Sunday, June 11, 2017. Participants march down Manhattan's Fifth Avenue during the 60th annual Puerto Rican Day Parade on Sunday, June 11, 2017. Spectators cheer and wave flags during the Puerto Rican Day Parade on Sunday, June 11, 2017. New York City Council Speaker Melissa Mark-Viverito, center, marches with fellow council members in the 60th annual Puerto Rican Day Parade in Manhattan on Sunday, June 11, 2017. Participants wave an oversized Puerto Rican flag during the 60th annual Puerto Rican Day Parade in Manhattan on Sunday, June 11, 2017. Mayor Bill de Blasio attends the Puerto Rican Day Parade on June 11, 2017. Attendees of the Puerto Rican Day Parade gather along Fifth Avenue on Sunday, June 11, 2017. 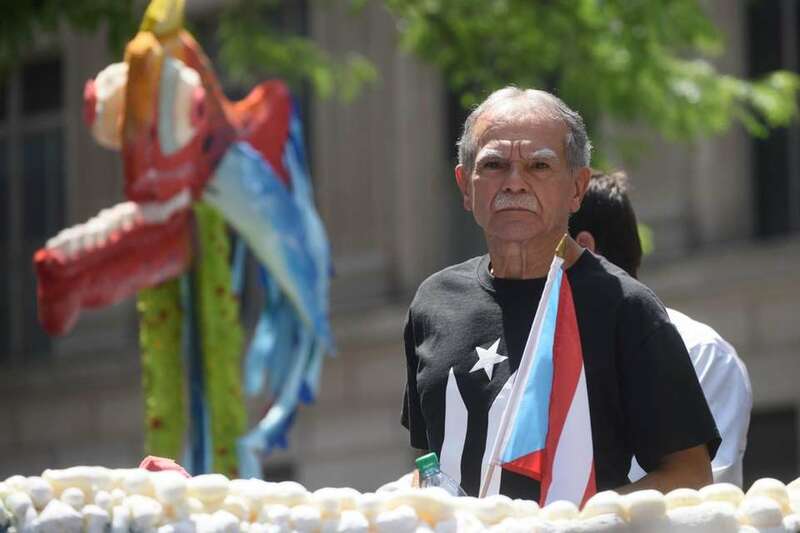 Controversy doesn't dampen Puerto Rican pride at paradeThe controversy over Oscar López Rivera didn't diminish the Puerto Rican pride that drives the parade. Olympian dishes on being honored at Puerto Rican Day ParadeIt’s the first time Hernandez, whose both sets of grandparents are from Puerto Rico, will be attending the parade.